Fred Mayor was one of the truly original and innovative members of the Staithes Group. He spent his earlier years analysing relevant elements in the work of artists whom he admired and experimenting with a variety of styles. By the time he moved away from Staithes he had developed his own unique vision as an artist which he went on to explore and develop. It is not surprising that Mayor absorbed the influences of other artists as he was immersed in their world from 1886 when, like many other Staithes Group artists, he enrolled at the prestigious Academie Julian in Paris. Unlike most other students, however, he studied there for four years and enrolled for a further short session in 1892. During his first initial period of study in France, shortly after his twenty-first birthday, he had his first painting, entitled 'Autumn', accepted for exhibition at the Royal Academy in London. Between his two sessions at the Academie Julian he shared a studio with Frank Brangwyn in Chiswick and while he was in Paris he met Philip Wilson Steer and Walter Richard Sickert who remained close friends for the rest of his life. Moving to Amberley he lived close to another artist friend, Edward Stott, and when he went to live amongst the artist's colony in Staithes in 1899 he shared lodgings with Arthur Friedenson and Harold Knight at the house of Mr. and Mrs. George Porritt in Gun Gutter. He was elected a founder member of the Staithes Art Club in 1901. Laura Knight said of the work he produced in Staithes, "Fred Mayor made a brilliant showing, but he was full of tricks that he had picked up here, there and everywhere. Some of his watercolours were quite lovely, and he had a beautiful colour sense when he forgot the Stotts, the Brangwyns and the Melvilles he was so constantly imitating." He had certainly established his own style by the time he was painting in Montreuil. Broad and vigorous brushstrokes placed with great certainty capture the movement and the light of the moment. His oil paintings at times show a vibrancy of line and use of colour, often incorporating flecks of pure and brilliant primary colour, far ahead of their time and which I am sure will be greatly appreciated by our sophisticated Staithes Group collectors. His watercolours are, indeed, "quite lovely" with the melting, wet paper effects used by Melville with much smaller strokes, Fred's broader ones stamping his own style on them most firmly. He eloped to live in Montreuil-sur-Mer with Hannah Hoyland, a fellow Staithes artist, in 1902, the year she was elected a member of the Staithes Art Club. Born in Yorkshire, Hannah was the daughter of a wealthy Sheffield brush maufacturer who had a summer home at Runswick Bay. After leaving Sheffield High School she studied at the Royal Female School of Art in London and then at the Westminster School of Art. Back on the Yorkshire coast she mixed with the other artists working there and met her future husband. Her family disapproved of the liaison, despite the couple both being in their thirties and they eloped to marry in London and went to France having been lent ten pounds by Hannah's sympathetic aunt, the actress Edith Wynne Mathison. 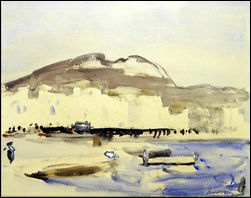 Whilst living in France Fred spent some winters with Spence Ingall who had a house on the outskirts of Tangiers and later would spend the winter in Cassis near Marseilles where some of these pictures were painted. 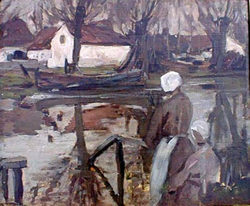 Fred Mayor's works have been displayed in many galleries. Click here to see a list of exhibitions and press cuttings. Fred exhibited at Le Salon, Paris, the Baillie Gallery, the Glasgow Institute of the Fine Arts, the Goupil Gallery, the Walker Gallery Liverpool, the Leicester Gallery, the London Salon, Manchester City Art Gallery, the New English Art Club, the Royal Academy, the Royal Society of British Artists, the Royal Scottish Academy and the Yorkshire Union of Artists. He has works in public collections in Birmingham, Leeds, Middlesbrough, Manchester, Sheffield, Whitby, the Tate Britain, the Victoria and Albert Museum, the Imperial War Museum and the UK Government and New Zealand National Art Collections. Compiled by Rosamund Jordan, October 2003. 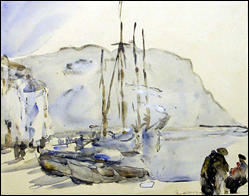 Fred Mayor produced many spontaneous sketches and fine sea-scapes in both oil and water colour.